A new report into the fatal Croydon tram crash has been published by the Rail Accident Investigation Branch (RAIB). As a result of the accident, which took place on 16th November 2016, 7 people lost their lives and 16 suffered serious injuries. A total of 70 passengers were on board the south London Tramlink tram, which was travelling between New Addington and Wimbledon. As it approached Sandilands Junction station in Croydon, the tram derailed and overturned on a curve in the track. An initial report published soon after the accident, showed that the tram was travelling at 46 mph in a 13mph speed zone, three-and-a-half times the speed limit. In the RAIB’s latest findings, they have concluded that the driver, Alfred Dorris, “lost awareness” as he was approaching the corner where the 13mph zone was located. He applied the vehicle’s brake only two and a half seconds before the crash and failed to use the emergency brake. RAIB also found that a lack of effective signage was partly responsible for the incident. Although a 20kph (13mph) sign was located at the start of the curve on which the tram derailed, concerns were raised about its position and how easily visible it was to drivers. According to the report, for the driver to have slowed sufficiently to 13mph upon reaching the sign, he would have to brake 180 metres beforehand. On the morning of the accident, it was heavily raining so it is likely that sign was even more difficult to read than usual. The inquiry report also indicated that passengers were “ejected or partially ejected” from the tram through broken windows. A more comprehensive report is expected later this year. While Transport for London has paid out more than £500,000 in financial support, many of the passengers who were on board are struggling as result of the accident. Some have suffered life-changing injuries and many more have been unable to work as a result of their injuries. 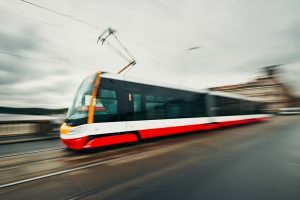 If you or a family member were involved in the devastating Croydon tram crash or another tram accident, you might be able to claim tram accident compensation. Get in touch with the expert team of solicitors at First Personal Injury by calling 0800 808 9740 or make a claim online.